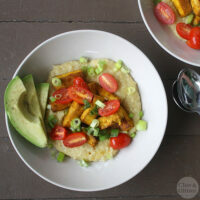 A hearty grits bowl topped with creamy avocado and savory baked strips of tofu. 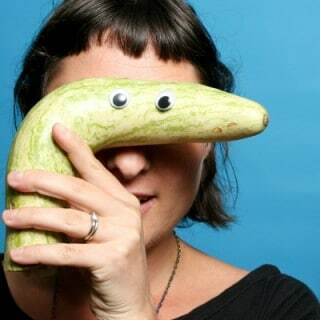 Happy Vegan Month of Food (Vegan MoFo), y’all! Every year, vegan and not-vegan food bloggers all come together to celebrate the wonders of delicious vegan food. This year, the MoFo team has put together 30 days of writing prompts, and they look like a lot of fun! I’m going to do my best to stick to the prompts on my posting days! Today’s prompt is “Tell us about your breakfast,” and the timing couldn’t be more perfect. My husband recently has begun the quest for the perfect homemade grits bowl, and I wanted to share one of my favorites that we’ve come up with. This grits bowl is almost like a deconstructed breakfast sandwich. Slap the toppings between two slices of bread, and you’ve got breakfast on the go. But if you’re a grits-lover like Dave is, you probably won’t want to ever take this meal out of a bowl. The tofu strips are the real stars of this grits bowl recipe, at least for me, and marinating them is key. I know that even on a lazy morning, marinating tofu probably isn’t what you want to do, so I’d suggest marinating overnight instead. Once that step is under control, you can do everything else in a super lazy fashion. 4 servings grits - You’re going to follow package directions here. toppings of your choice – I used a handful of sliced grape tomatoes and a bit of chopped green onion. Whisk together the soy sauce, turmeric, onion powder, and olive oil to make your marinade. Toss the marinade with the tofu strips, and let them sit for at least 15 minutes. If you like, you can make these the night before, so they’ll be ready to rock in the morning. Arrange your tofu strips on a baking sheet lined with a Silpat. Bake for 15 minutes, flip the strips, and bake for 15 minutes more. While the tofu is baking, prepare your grits. Try to time this so the grits finish cooking around the time that the tofu is done. When you start depends on whether you’re using instant, quick, or old-school grits. Don’t forget that you need to allow a few extra minutes for water to boil, if you’re making them on the stovetop! When the grits are ready, stir in the nutritional yeast and margarine, and divide between 4 bowls. 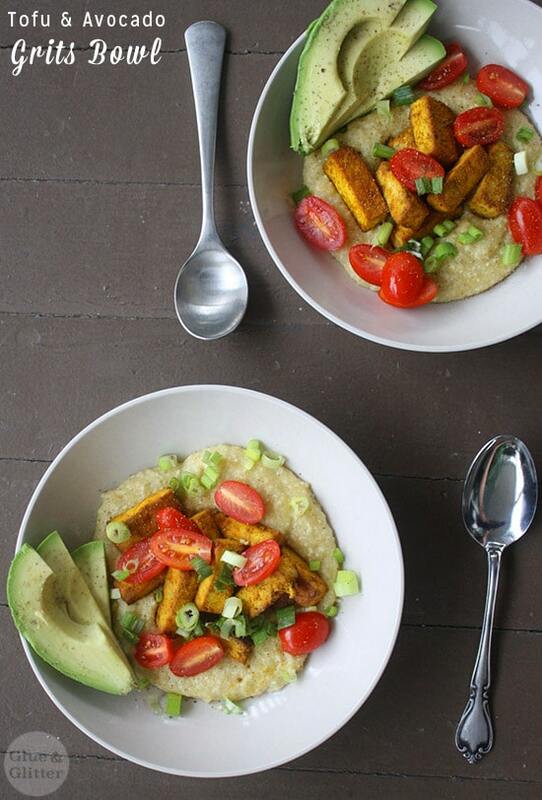 Top each bowl with 1/4 of the baked tofu strips, 1/4 of the avocado, and 1/4 of the tomatoes. Salt and pepper those bowls, and serve! I will be making this ASAP, looks amazing Becky. Thank you! It’s still one of our favorite breakfasts! Looks delicious bowl, thanks for sharing with Hearth and soul blog hop, pinning and tweeting. Do you press your tofu before you marinate it? Definitely before. It will soak up the marinade even better that way! This looks so dreamy, Becky! I wish I ate more grits. My Opa ate them all the time so my mother grew up on them, but they were never made for me as a kid. I’m not sure I’ve ever even had them done right. Same here. My folks never made us grits when we were kids, but my husband grew up on them. He used to ask his mama for grits every morning! I basically started eating grits because of Dave. I’ve had pretty good luck just following the directions on the package – Bob’s Red Mill has good slow grits, if you want to be authentic! This sounds perfect! I love a savory breakfast with lots of different components. Thank you, Cadry! Me too. I wish I had more long mornings to make these kinds of breakfasts!